Action from Peterborough League Division Four as Premiair (stripes) beat Feeder FC 3-1. Photo: David Lowndes. 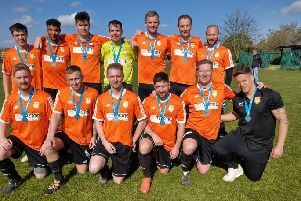 Pinchbeck United came from behind to beat ICA Sports 2-1 in a Peterborough League President’s Shield quarter-final on Saturday (January 21). Tom Curtis, the son of manager Hamish, shot the city side in front in the first-half, but second-half strikes from top scorer Oliver Maltby and Brad Murrell eased the home side into the semi-finals. Netherton United and Ketton are also through to the semi-finals. The final quarter-final between Moulton Harrox and Wisbech Town Reserves is scheduled for February 4. Netherton moved a point clear at the top of the Premier Division as a single Tom Randall goal saw off plucky strugglers Stilton United 1-0 at the Grange. But Netherton boss Jon Harrison applauded the visitors off the pitch after an effort he described as ‘heroic’. Players from Feeder FC (blue|) and Premiair get stuck in during their Peterborough League Division Four match. Photo: David Lowndes. Moulton Harrox are up to second place after a 4-1 win over Wisbech Town Reserves. Ben Allen scored twice. And Peterborough Sports are up to third following their 4-0 win over Leverington. Liam Merryweather (2), Dan Drane and new signing Ian Bradbury claimed their goals. Sports are in great shape as they trail Netherton by just two points and have three games in hand. Big movers of the day were Stamford Lions who are now sixth after thrashing AFC Stanground Sports 9-0. Stanground had won their previous top-flight match 9-2! Ball juggling from a Premiair player during a win over Feeder FC. Photo: David Lowndes. Luke Ball’s hat-trick led the Stamford scoring spree. while Alex Brockbank and Rob Forster both scored twice. Scott Spearink scored twice in Langtoft’s 3-0 win over bottom club Uppingham, while Seb Hood’s first-half goal was enough for Ketton to pip Thorney 1-0. Zak Fisher made it four goals in his last three games for Sawtry with a goal in a 2-2 draw with Deeping Rangers Reserves. Three Peterborough League Division Three teams are into the semi-finals of the Northants Area Cup after quarter-final succeses on Saturday. Eye United beat Harpole Reserves 4-3 on penalties following a 1-1 draw. Andrew Buckle scored their goal in normal time. Bretton North End overcame the loss of Robbie Osker to a red card to win 4-2 at Weedon through goals from Jordan Fiddes, Fernand Bass, Kyle Gray and Tom Flatters, while Brotherhood Sports pipped Northampton FC Fotogold 2-1. Ramsey lost Dan Edwards to a red card after half an hour of their Hunts Junior Cup semi-final with Peterborough Division Two rivals AFC Stanground Sports Reserves, but still won 3-2. Adam Taylor (2) and Jamie Darlow scored for the Rams who go on to meet Eaton Socon Reserves in the final. The Division Four title race is hotting up with city sides Cardea and Premiair queueing up to overtake long-time leaders Holbeach Bank. Cardea won 4-2 at Bank on Saturday with two late goals from substitute Adam Stacey proving decisive. Shane Cooke also netted in the final 10 minutes after Kieran Hart’s first-half goal. Premiar beat city rivals Feeder 3-1 thanks to goals from Chris Ward, Thomas Brown and Ryan Alban. Peterborough Sports Res 4 (Merryweather 2, Bradbury, Drane), Leverington Sports 0. Stamford Lions 9 (Ball 3, Brockbank 2, Forster 2, Lippett, Travers), AFC Stanground Sports 0. Pinchbeck United 2 (Maltby, Murrell), ICA Sports 1 (Curtis).